Congratulations! You've just found the only roofing company you'll ever need, because at Hutson Roofing, we are dedicated to providing quality without compromise at competitive prices. Specializing in cost-effective roofing, we are a full-service roofing company with experience in both installations and repairs. Among the many benefits of a Hutson Roofing roof are energy efficiency, durability, and a beautiful variety. Regardless of your home decor, you can rest assured that we have a roof just for you and your budget. We are fully insured and bonded, and all employees are hand-picked to ensure that your experience with us is an enjoyable one. So whether your roofing needs are commercial or residential, count on Hutson Roofing to handle everything from inspection to cleanup in a timely, efficient manner. At Hutson Roofing we also install and repair gutters and siding. For more information or to schedule an appointment, give us a call today. 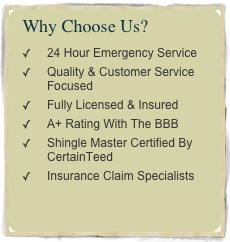 We work year round and offer 24/7 emergency patching! Copyright 2011, Hutson Roofing - All Rights Reserved.